"This sauce is quick and easy. It goes well with other pasta types such as tortellini or penne. I serve this with a good quality, crusty bread." While the pasta is cooking, prepare the sauce. In a large nonstick skillet, heat 1 tablespoon oil over a medium high heat. Add tomatoes, artichokes, scallions, garlic, and salt and pepper. Cook 2 to 3 minutes, stirring occasionally, until vegetables are warmed through. Remove from heat. Drain pasta well. Transfer to a large bowl, and toss with 1 teaspoon oil. Add half of the sauce to the ravioli; toss gently, but thoroughly to mix. Transfer ravioli to a large serving platter. Pour remaining vegetable sauce over ravioli. Garnish with Parmesan cheese. This delicious pasta dish comes together in just minutes. 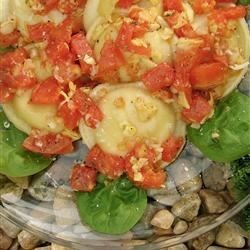 This was a nice change for ravioli and it was quick and easy, but I would not make it again. Great recipe for weekday dinners. Quick and easy to make, yet elegant to serve.